I’ll start with a warning, this is not blues, nor is it blues/rock, but a mini-album featuring seven original guitar pieces inspired by the Cincinnati Ballet. 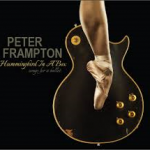 Frampton composed all the songs on the cd along with Gordon Kennedy, who also co-produced. This project came about because in 2013 the Cincinnati Ballet used music from his Fingerprints album and a song from Now (Not Forgotten). In a nutshell, Frampton was asked if he could compose about twenty minutes of instrumental and vocal music for a future performance and he duly obliged along with the aforementioned Kennedy. I hope I haven’t put you off the idea yet, because this is pure bliss, both acoustic and electric in equal measure with a full band. Standout tracks for me are The One In 1901 with its electric soloing and bluesy, jazzy leads, not normally what one would associate with ballet, Friendly Fire is heavy, Heart To My Chest is beautiful and a strange Norman Wisdom closes it all with a Django Reinhardt-ish feel. Clocking in, as I say, at just short of half an hour, a little short, but the undeniable quality makes it worthwhile.